ດາວຍົມ (ດັດສະນີດາວເຄາະນ້ອຍ: 134340 Pluto) ແມ່ນ ດາວເຄາະແຄະ ທີ່ຢູ່ໃນແຖບໄຄເປີ, ເຊິ່ງເປັນວົງແຫວນທີ່ຮວບຮວມເອົາບັນດາວັດຖຸພົ້ນດາວເກດໄວ້. ມັນເປັນວັດຖຸທຳອິດໃນກຸ່ມດັ່ງກ່າວທີ່ຖືກຄົ້ນພົບ ແລະ ເປັນດາວເຄາະແຄະທີ່ມີມວນໃຫຍ່ໃຫຍ່ທີ່ສຸດ ແລະ ມີຂະໜາດໃຫຍ່ເປັນອັນດັບທີສອງທີ່ຮູ້ຈັກກັນໃນລະບົບສຸລິຍະ, ເປັນວັດຖຸທີ່ມີມວນໃຫຍ່ເປັນອັນດັບທີ 10 ແລະ ມີຂະໜາດໃຫຍ່ເປັນອັນດັບທີ 9 ທີ່ໂຄຈອນອ້ອມດວງຕາເວັນໂດຍກົງ. ມັນເປັນວັດຖຸພົ້ນດາວເກດທີ່ມີບໍລິມາດໃຫຍ່ທີ່ສຸດ ແຕ່ວ່າມີມວນໜ້ອຍກວ່າ ເອຣິສ, ດາວເຄາະແຄະທີ່ຢູ່ໃນແຖບຫີນກະຈາຍ. ເຊັ່ນດຽວກັບວັດຖຸອື່ນໆໃນແຖບໄຄເປີ, ດາວຍົມແມ່ນມີສ່ວນປະກອບຂອງນ້ຳແຂງ ແລະ ຫີນໂດຍພື້ນຖານ ແລະ ມີຂະໜາດປະມານ 1/6 ຂອງດວງຈັນ ແລະ ມີບໍລິມາດ 1/3 ຂອງດວງຈັນ. ມັນມີຄວາມເຍື້ອງສູນກາງພໍສົມຄວນ ແລະ ໂຄຈອນຢູ່ລະຫວ່າງ 30 to 49 ໜ່ວຍດາລາສາດ (4.4–7.3 ຕື້ ກິໂລແມັດ) ຈາກດວງຕາເວັນ. ນີ້ໝາຍຄວາມວ່າ ບາງຄັ້ງຄາວ ດາວຍົມຈະໂຄຈອນມາໃກ້ດວງຕາເວັນຫຼາຍກວ່າດາວເກດ, ແຕ່ວ່າການສັ່ນພ້ອງຂອງວົງໂຄຈອນທີ່ສະຖຽນກັບດາວເກດໄດ້ປົກປ້ອງບໍ່ໃຫ້ພວກມັນໂຄຈອນມາຕຳກັນ. ໃນປີ 2014, ດາວຍົມຢູ່ຫ່າງຈາກດວງຕາເວັນໃນໄລຍະ 32.6 AU. ແສງຈາກດວງຕາເວັນໃຊ້ເວລາ 5.5 ຊົ່ວໂມງໃນການເດີນທາງໄປເຖິງດາວຍົມດ້ວຍໄລຍະຫ່າງສະເລ່ຍ (39.4 AU). ດາວຍົມຖືກຄົ້ນພົບເມື່ອປີ 1930 ໂດຍ Clyde Tombaugh, ແລະ ໃນເບື້ອງຕົ້ນຖືກຈັດເປັນດາວເຄາະດວງທີເກົ້າ. ພາຍຫຼັງປີ 1992, ສະຖານະດາວເຄາະຂອງມັນໄດ້ກາຍເປັນຂໍ້ສົງໄສເນື່ອງຈາກມີການຄົ້ນພົບວັດຖຸຕ່າງໆທີ່ມີຂະໜາດໃກ້ຄຽງກັນຫຼາຍດວງຢູ່ໃນແຖບໄຄເປີ. ໃນປີ 2005, ເອຣິສ, ເຊິ່ງມີຂະໜາດໃຫຍ່ກວ່າດາວເກດເຖິງ 27%, ຖືກຄົ້ນພົບ ແລະ ນຳສະຫະພັນດາລາສາດສາກົນ (IAU) ໄປສູ່ການນິຍາມຄວາມໝາຍຂອງຄຳວ່າ "ດາວເຄາະ" ເປັນຄັ້ງທຳອິດຢ່າງເປັນທາງການ ໃນປີຕໍ່ມາ. ນິຍາມດັ່ງກ່າວໄດ້ແຍກດາວຍົມອອກມາ ແລະ ຖືກຈັດປະເພດກາຍເປັນສະມາຊິກໃໝ່ຂອງໝວດ "ດາວເຄາະແຄະ" (ເຈາະຈົງແມ່ນວັດຖຸປະເພດ plutoid). ນັກດາລາສາດບາງສ່ວນເຊື່ອວ່າ ດາວຍົມຄວນຈະຍັງຖືກຈັດປະເພດເປັນດາວເຄາະ. ດາວຍົມມີດວງຈັນທີ່ຮູ້ຈັກ 5 ດວງ: ຄາຣອນ (ດວງທີ່ໃຫຍ່ທີ່ສຸດ, ເຊິ່ງມີເສັ້ນຜ່າສູນກາງຫຼາຍກວ່າເຄິ່ງໜຶ່ງຂອງດາວຍົມ), ສະຕິກສ໌, ນິກສ໌, ເຄີເບຣອສ ແລະ ໄຮດຣາ. ໃນບາງຄັ້ງ ດາວຍົມ ແລະ ຄາຣອນກໍຖືກຈັດເປັນລະບົບດາວຄູ່ ເນື່ອງຈາກ ຈຸດສູນກາງມວນ ຂອງວົງໂຄຈອນຂອງພວກມັນບໍ່ໄດ້ປິ່ນອ້ອມດວງໃດດວງໜຶ່ງ. ສະຫະພັນດາລາສາດສາກົນ (IAU) ຍັງບໍ່ທັນໄດ້ກຳນົດນິຍາມຂອງດາວເຄາະແຄະຄູ່ຢ່າງເປັນທາງການເທື່ອ ແລະ ຄາຣອນກໍຍັງຖືກຈັດເປັນດວງຈັນຂອງດາວຍົມຢູ່. ໃນວັນທີ 14 ກໍລະກົດ 2015, ຍານອາວະກາດNew Horizons ໄດ້ກາຍເປັນຍານລຳທຳອິດທີ່ບິນຜ່ານດາວຍົມ. ໃນການບິນຜ່ານຄັ້ງນີ້ ຍານ New Horizons ໄດ້ທຳການວັດແທກ ແລະ ສຳຫຼວດດາວຍົມ ແລະ ບັນດາດວງຈັນຂອງມັນຢ່າງລະອຽດ. ໃນຊຸມປີ 1840, ອວກເບນ ເລີ ແວກຣີເຢ (Urbain Le Verrier) ໄດ້ໃຊ້ ກົນລະສາດນິວເຕິນ ໃນການທຳນາຍຕຳແໜ່ງຂອງດາວເກດ ເຊິ່ງເປັນດາວເຄາະທີ່ຍັງບໍ່ທັນຖືກຄົ້ນພົບໃນຕອນນັ້ນ ໂດຍການປະມວນຜົນຈາກການລົບກວນທີ່ມີຕໍ່ວົງໂຄຈອນຂອງດາວມະລຶດຕະຍູ. ການສຳຫຼວດດາວເກດທີ່ຕາມມາພາຍຫຼັງໃນຕົ້ນສະຕະວັດທີ 19 ໄດ້ພານັກດາລາສາດໄປສູ່ການຕັ້ງຂໍ້ສັງເກດວ່າ ວົງໂຄຈອນຂອງດາວມະລຶດຕະຍູກຳລັງຖືກລົບກວນໂດຍດາວເຄາະອື່ນນອກຈາກດາວເກດ. ໃນປີ 1906, ເພີຊີວານ ໂລເວວ (Percival Lowell), ຄົນບອສຕັນທີ່ຮັ່ງມີເຊິ່ງເປັນຜູ່ກໍ່ຕັ້ງຫໍເບິ່ງດາວໂລແວນ ທີ່ ເມືອງແຟຼັກສະຕາບ, ລັດອາຣິໂຊນາ ໃນປີ 1894 ໄດ້ເລີ່ມໂຄງການເພີ່ມເຕີມໃນການຄົ້ນຫາດາວເຄາະດວງທີ 9 ເຊິ່ງລາວໄດ້ຕັ້ງຊື່ວ່າ "ດາວເຄາະ X". ຮອດປີ 1909, ໂລແວນ ແລະ ວິນລຽມ ເຮັນຣີ ພິກເກີຣິງ (William H. Pickering) ໄດ້ສະເໜີພິກັດທ້ອງຟ້າທີ່ເປັນໄປໄດ້ຫຼາຍອັນສຳລັບດາວເຄາະດວງດັ່ງກ່າວ. ໂລແວນ ແລະ ຫໍເບິ່ງດາວຂອງລາວໄດ້ທຳການຄົ້ນຫາຈົນກະທັ້ງລາວໄດ້ເສຍຊີວິດໃນປີ 1916, ແຕ່ວ່າບໍ່ໄດ້ຮັບຜົນສຳເລັດແຕ່ຢ່າງໃດ. ໂລແວນບໍ່ຮູ້ເລີຍວ່າການສຳຫຼວດຂອງລາວໄດ້ຖ່າຍຮູບພາບທີ່ເລືອນລາງ 2 ຮູບຂອງດາວຍົມໃນວັນທີ 19 ມີນາ ແລະ 7 ເມສາ 1915, ແຕ່ວ່າຍັງບໍ່ທັນຖືກຮັບຮູ້ວ່າພວກມັນແມ່ນຫຍັງກັນແທ້. ມີການສຳຫຼວດຈາກຮູບພາບອື່ນໆອີກ 14 ຄັ້ງ, ເຊິ່ງເກົ່າທີ່ສຸດແມ່ນດຳເນີນການໂດຍຫໍເບິ່ງດາວເຢີກສ໌ ໃນວັນທີ 20 ສິງຫາ 1909. ເນື່ອງຈາກການຕໍ່ສູ້ທາງດ້ານກົດໝາຍກັບເປັນເວລາ 10 ປີກັບກົງສະແຕັງ ໂລແວນ (Constance Lowell), ເມຍໝ້າຍຂອງເພີຊີວານ ຜູ່ທີ່ພະຍາຍາມຍາດຊີງສ່ວນແບ່ງມໍລະດົກມູນຄ່າຫຼາຍລ້ານໂດລາຂອງຫໍເບິ່ງດາວດັ່ງກ່າວ, ການຄົ້ນຫາດາວເຄາະ X ບໍ່ໄດ້ດຳເນີນການຕໍ່ຈົນກະທັ້ງປີ 1929, ເມື່ອຜູ່ອຳນວຍການຂອງຫໍເບິ່ງດາວ, ເວສໂຕ ເມນວິນ ສະລິເຟີ (Vesto Melvin Slipher), ໄດ້ສົ່ງຕໍ່ການຄົ້ນຫາດາວເຄາະ X ໃຫ້ແກ່ ໄຄຼດ໌ ທອມໂບ, ຄົນຈາກລັດແຄນຊັສ ອາຍຸ 23 ປີ ຜູ່ທີ່ຫາກໍຈະມາເຖິງຫໍເບິ່ງດາວໂລແວນຫຼັງຈາກສະລິເຟີໄດ້ປະທັບໃຈໃນຜົນງານການແຕ້ມຮູບກ່ຽວກັບດາລາສາດຂອງລາວ. ພາລະກິດຂອງທອມໂບແມ່ນການຖ່າຍພາບທ້ອງຟ້າຕອນກາງຄືນເປັນຄູ່ໆຢ່າງເປັນລະບົບ, ຫຼັງຈາກນັ້ນຈຶ່ງນຳເອົາຮູບພາບແຕ່ລະຄູ່ມາກວດກາ ແລະ ສັງເກດວ່າມີວັດຖຸໃດທີ່ໄດ້ປ່ຽນຕຳແໜ່ງ ຫຼື ບໍ່. ດ້ວຍການໃຊ້ເຄື່ອງມືປຽບທຽບຄວາມແຕກຕ່າງ, ລາວສາມາດສ້າງພາບຈຳລອງການເຄື່ອນທີ່ຂອງວັດຖຸຕ່າງໆເທິງທ້ອງຟ້າທີ່ມີການປ່ຽນຕຳແໜ່ງ ຫຼື ປະກົດຂຶ້ນໃນແຕ່ລະຮູບ. ໃນວັນທີ 18 ກຸມພາ 1930, ຫຼັງຈາກການຄົ້ນຫາເກືອບ 1 ປີ, ທອມໂບຄົ້ນພົບວັດຖຸເຄື່ອນທີ່ທີ່ເປັນໄປໄດ້ໃນຮູບພາບທີ່ຖ່າຍໃນລະຫວ່າງວັນທີ 23 ແລະ 29 ມັງກອນໃນປີດຽວກັນ. ຮູບຖ່າຍທີ່ມີຄຸນນະພາບຕ່ຳກວ່າທີ່ຖ່າຍໄວ້ໃນວັນທີ 21 ມັງກອນຊ່ວຍຢືນຢັນການເຄື່ອນທີ່ດັ່ງກ່າວ. ພາຍຫຼັງຫໍເບິ່ງດາວໄດ້ຮວບຮວມເອົາຮູບຖ່າຍຢືນຢັນເພີ່ມເຕີມ, ຂ່າວກ່ຽວກັບການຄົ້ນພົບກໍໄດ້ຖືກສົ່ງຕໍ່ທາງໂທລະເລກໄປຍັງຫໍເບິ່ງດາວມະຫາວິທະຍາໄລຮາເວີດ ໃນວັນທີ 13 ມີນາ 1930. ການຄົ້ນພົບໄດ້ກາຍເປັນຫົວຂໍ້ຂ່າວໃນທົ່ວໂລກ. ຫໍເບິ່ງດາວໂລແວນ, ເຊິ່ງມີສິດໃນການຕັ້ງຊື່ວັດຖຸໃໝ່ນີ້ ໄດ້ຮັບການແນະນຳຊື່ຕ່າງໆຫຼາຍກວ່າ 1,000 ຊື່ຈາກທົ່ວໂລກ ບໍ່ວ່າຈະເປັນ ແອັດລາສ (Atlas) ໄປຈົນເຖິງ ຊີມານ (Zymal). ທອມໂບໄດ້ຮ້ອງຂໍໃຫ້ສະລິເຟີແນະນຳຊື່ຂອງວັດຖຸໃໝ່ນີ້ຢ່າງວ່ອງໄວກ່ອນທີ່ຄົນອື່ນຈະຕັ້ງຊື່ໃຫ້ມັນກ່ອນ. ກົງສະແຕັງ ໂລແວນ ໄດ້ສະເໜີຊື່ ຊຸສ (Zeus) ຈາກນັ້ນແມ່ນ ເພີຊີວານ ແລະ ສຸດທ້າຍແມ່ນ ກົງສະແຕັງ. ການສະເໜີຂອງນາງຖືກເມີນເສີຍ. ຊື່ ດາວເກດ 'Pluto' ແມ່ນັ້ງຕາມຊື່ຂອງ ເທບແຫ່ງໂລກເບື້ອງລຸ່ມ ເຊິ່ງກໍຄືນາລົກນັ້ນເອງ, ໄດ້ຖືກສະເໜີໂດຍ ເວເນເຊຍ ເບີນີ (Venetia Burney) (1918–2009), ເຊິ່ງຕອນນັ້ນເປັນນັກຮຽນຍິງອາຍຸ 11 ປີ ໃນ ອັອກສ໌ຟອດ, ປະເທດອັງກິດ ທີ່ມີຄວາມສົນໃຈໃນຕຳນານເທບດັ້ງເດີມ. ລາວໄດ້ແນະນຳຊື່ນີ້ໃນການສົນທະນາກັບພໍ່ເຖົ້າຂອງລາວ ຟານໂຄເນີ ມາດານ, ບັນນາລັກເກົ່າທີ່ ຫໍສະໝຸດໂບດລຽນ ຂອງ ມະຫາວິທະຍາໄລອັອກສ໌ຟອດ, ຜູ່ທີ່ໄດ້ສົ່ງຊື່ໄປຍັງສາສະດາຈານດ້ານດາລາສາດ ເຮີເບີດ ຮໍ ເທີນເນີ (Herbert Hall Turner) ເຊິ່ງເປັນຄົນສົ່ງໂທລະເລກໄປປຫາເພື່ອນຮ່ວມງານທີ່ສະຫະລັດອາເມລິກາ. ວັດຖຸດັ່ງກ່າວໄດ້ຮັບການຕັ້ງຊື່ຢ່າງເປັນທາງການເມື່ອວັນທີ 24 ມີນາ 1930. ສະມາຊິກຂອງຫໍເບິ່ງດາວໂລແວນໄດ້ຮັບອະນຸຍາດໃຫ້ລົງຄະແນນເລືອກເອົາໃນບັນດາ 3 ຊື່ ທີ່ຖືກຄັດເລືອກ ປະກອບດ້ວຍ: ມິເນີວາ (Minerva) (ຖືກຕັ້ງເປັນຊື່ຂອງດາວເຄາະນ້ອຍແລ້ວ), ໂຄຣນຸສ (Cronus) (ເສຍຄະແນນເນື່ອງຈາກຖືກສະເໜີຊື່ໂດຍນັກດາລາສາດທີ່ບໍ່ມີຊື່ສຽງ ໂທມັດ ເຈເຟີສັນ ແຈັກສັນ ຊີ (Thomas Jefferson Jackson See)) ແລະ ພຼູໂຕ (Pluto). Pluto ໄດ້ຮັບຄະແນນສຽງສູງສຸດ. ຊື່ດັ່ງກ່າວໄດ້ຖືກປະກາດໃນວັນທີ 1 ພຶດສະພາ 1930. ໃນເວລາທີ່ປະກາດນັ້ນ, ມາດານໄດ້ມອບເງິນຈຳນວນ 5 ປອນ (ເທົ່າກັບ ແມ່ແບບ:Inflation ປອນ, ຫຼື 430 ໂດລາສະຫະລັດໃນປີ ໒໐໑໙),ແມ່ແບບ:Inflation-fn ໃຫ້ແກ່ເວເນເຊຍເປັນລາງວັນ. Most languages use the name "Pluto" in various transliterations.ແມ່ແບບ:Efn In Japanese, Houei Nojiri suggested the translation ແມ່ແບບ:Nihongo3, and this was borrowed into Chinese, Korean, and Vietnamese. Some Indian languages use the name Pluto, but others, such as Hindi, use the name of Yama, the Guardian of Hell in Hindu and Buddhist mythology, as does Vietnamese. Polynesian languages also tend to use the indigenous god of the underworld, as in Maori Whiro. 0.01 (1/100) Earth Cruikshank, Pilcher, & MorrisonScript error: No such module "Footnotes". As objects increasingly closer in size to Pluto were discovered in the region, it was argued that Pluto should be reclassified as one of the Kuiper belt objects, just as Ceres, Pallas, Juno and Vesta eventually lost their planet status after the discovery of many other asteroids. On 29 July 2005, the discovery of a new trans-Neptunian object, Eris, was announced, which was thought to be substantially larger than Pluto. This was the largest object discovered in the Solar System since Triton in 1846. Its discoverers and the press initially called it the tenth planet, although there was no official consensus at the time on whether to call it a planet. Others in the astronomical community considered the discovery the strongest argument for reclassifying Pluto as a minor planet. The object must be massive enough to be rounded by its own gravity. More specifically, its own gravity should pull it into a shape of hydrostatic equilibrium. Pluto fails to meet the third condition, because its mass is only 0.07 times that of the mass of the other objects in its orbit (Earth's mass, by contrast, is 1.7 million times the remaining mass in its own orbit). The IAU further decided that bodies that, like Pluto, do not meet criterion 3 would be called dwarf planets. On 13 September 2006, the IAU included Pluto and Eris and its moon Dysnomia in their Minor Planet Catalogue, giving them the official minor planet designations "(134340) Pluto", "(136199) Eris", and "(136199) Eris I Dysnomia". If Pluto had been given one upon its discovery, the number would have been about 1,164 instead of 134,340. There has been some resistance within the astronomical community toward the reclassification. Alan Stern, principal investigator with NASA's New Horizons mission to Pluto, publicly derided the IAU resolution, stating that "the definition stinks, for technical reasons". Stern's contention was that by the terms of the new definition Earth, Mars, Jupiter, and Neptune, all of which share their orbits with asteroids, would be excluded. He argued that all big spherical moons, including the Moon, should likewise be considered planets. His other claim was that because less than five percent of astronomers voted for it, the decision was not representative of the entire astronomical community. Marc W. Buie, then at Lowell Observatory, voiced his opinion on the new definition on his website and petitioned against the definition. Others have supported the IAU. Mike Brown, the astronomer who discovered Eris, said "through this whole crazy circus-like procedure, somehow the right answer was stumbled on. It's been a long time coming. Science is self-correcting eventually, even when strong emotions are involved." Public reception to the IAU decision was mixed. Although many accepted the reclassification, some sought to overturn the decision with online petitions urging the IAU to consider reinstatement. A resolution introduced by some members of the California State Assembly facetiously called the IAU decision a "scientific heresy". The New Mexico House of Representatives passed a resolution in honor of Tombaugh, a longtime resident of that state, that declared that Pluto will always be considered a planet while in New Mexican skies and that 13 March 2007, was Pluto Planet Day. The Illinois Senate passed a similar resolution in 2009, on the basis that Clyde Tombaugh, the discoverer of Pluto, was born in Illinois. The resolution asserted that Pluto was "unfairly downgraded to a 'dwarf' planet" by the IAU. Some members of the public have also rejected the change, citing the disagreement within the scientific community on the issue, or for sentimental reasons, maintaining that they have always known Pluto as a planet and will continue to do so regardless of the IAU decision. In 2006, in its 17th annual words of the year vote, the American Dialect Society voted plutoed as the word of the year. To "pluto" is to "demote or devalue someone or something". Researchers on both sides of the debate gathered on 14–16 August 2008, at the Johns Hopkins University Applied Physics Laboratory for a conference that included back-to-back talks on the current IAU definition of a planet. Entitled "The Great Planet Debate", the conference published a post-conference press release indicating that scientists could not come to a consensus about the definition of planet. Just before the conference, on 11 June 2008, the IAU announced in a press release that the term "plutoid" would henceforth be used to refer to Pluto and other objects that have an orbital semi-major axis greater than that of Neptune and enough mass to be of near-spherical shape. Pluto's orbital period is 248 Earth years. Its orbital characteristics are substantially different from those of the planets, which follow nearly circular orbits around the Sun close to a flat reference plane called the ecliptic. In contrast, Pluto's orbit is highly inclined relative to the ecliptic (over 17°) and highly eccentric (elliptical). This high eccentricity means a small region of Pluto's orbit lies nearer the Sun than Neptune's. 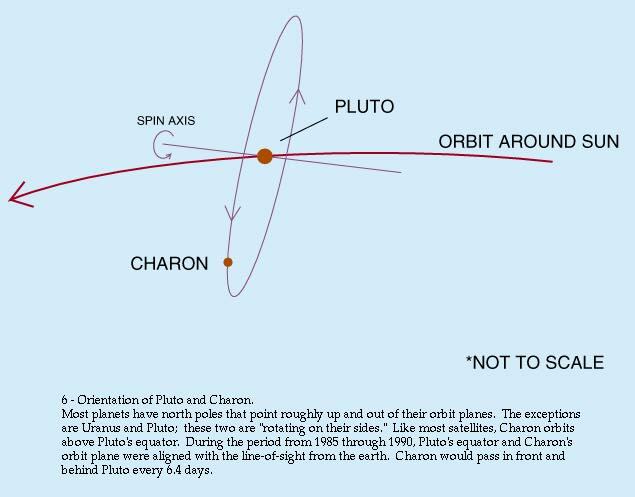 The Pluto–Charon barycenter came to perihelion on 5 September 1989,ແມ່ແບບ:Efn and was last closer to the Sun than Neptune between 7 February 1979, and 11 February 1999. In the long term, Pluto's orbit is chaotic. Although computer simulations can be used to predict its position for several million years (both forward and backward in time), after intervals longer than the Lyapunov time of 10–20 million years, calculations become speculative: Pluto is sensitive to immeasurably small details of the Solar System, hard-to-predict factors that will gradually disrupt its orbit. Pluto's rotation period, its day, is equal to 6.39 Earth days. Like Uranus, Pluto rotates on its "side" on its orbital plane, with an axial tilt of 120°, and so its seasonal variation is extreme; at its solstices, one-fourth of its surface is in continuous daylight, whereas another fourth is in continuous darkness. Daylight on Pluto is weak, analogous to twilight on Earth; NASA has posted a "Pluto Time" calculator that determines when the light on Earth is equivalent to that on Pluto on a clear day. For example, on 13 July 2015, at the coordinates of the Applied Physics Laboratory where the probe was constructed, the Pluto Time was 8:38 p.m., four minutes later than the apparent sunset of 8:34 p.m. reported for that location by NOAA. At least one minor body, ແມ່ແບບ:Mpl, is a quasi-satellite of Pluto, a specific type of co-orbital configuration. It has been a quasi-satellite of Pluto for about 100,000 years and it will remain so for perhaps another 250,000 years. Its quasi-satellite behavior is recurrent with a periodicity of 2 million years. There may be additional Pluto co-orbitals. Due to Pluto's distance from Earth, in-depth study from Earth is difficult. On July 14, 2015, NASA's New Horizons space probe flew through the Pluto system, which will provide much information about it. Pluto's surface is composed of more than 98 percent nitrogen ice, with traces of methane and carbon monoxide. The face of Pluto oriented toward Charon contains more methane ice, whereas the opposite face contains more nitrogen and carbon monoxide ice. Pluto's surface is very varied, with large differences in both brightness and color. Pluto is one of the most contrastive bodies in the Solar System, with as much contrast as Saturn's moon Iapetus. The color varies between charcoal black, dark orange and white. Pluto's color is more similar to that of Io with slightly more orange, significantly less red than Mars. Pluto's density is ແມ່ແບບ:Val. Because the decay of radioactive elements would eventually heat the ices enough for the rock to separate from them, scientists expect that Pluto's internal structure is differentiated, with the rocky material having settled into a dense core surrounded by a mantle of water ice. The diameter of the core is hypothesized to be approximately ແມ່ແບບ:Val, 70% of Pluto's diameter. It is possible that such heating continues today, creating a subsurface ocean layer of liquid water some 100 to 180 km thick at the core–mantle boundary. 1180 (2360) km Zalucha, et al. Pluto's mass is 1.31×1022 kg, less than 0.24 percent that of Earth, and its diameter is 2370 km. Its surface area is ແມ່ແບບ:Val, or roughly the same surface area as Russia. Its surface gravity is 0.063g (compared to 1g for Earth). With less than 0.2 lunar masses, Pluto is much less massive than the terrestrial planets, and also less massive than seven moons, Ganymede, Titan, Callisto, Io, the Moon, Europa, and Triton. The mass is much less than thought before Charon was discovered. Pluto is more than twice the diameter and a dozen times the mass of the dwarf planet Ceres, the largest object in the asteroid belt. It is less massive than the dwarf planet Eris, a trans-Neptunian object discovered in 2005, though Pluto has a larger diameter of 2370 km compared to Eris's approximate diameter of 2326 km. Determinations of Pluto's size had been complicated by its atmosphere, and possible hydrocarbon haze. In March 2014, Lellouch, de Bergh et al. published findings regarding methane mixing ratios in Pluto's atmosphere consistent with a Plutonian diameter greater than 2360 km, with a "best guess" of 2368 km. On 13 July 2015 NASA's New Horizons mission Long Range Reconnaissance Imager determined Pluto's diameter to be ແມ່ແບບ:Convert. ແມ່ແບບ:Main Pluto has a thin atmosphere consisting of nitrogen (N2), methane (CH4), and carbon monoxide (CO), which are in equilibrium with their ices on Pluto's surface. The surface pressure ranges from 6.5 to 24 μbar (0.65 to 2.4 Pa), roughly one million to 100,000 times less than Earth's atmospheric pressure. Pluto's elliptical orbit is predicted to have a major effect on its atmosphere: as Pluto moves away from the Sun, its atmosphere should gradually freeze out. When Pluto is closer to the Sun, the temperature of Pluto's solid surface increases, causing the ices to sublimate. Just like sweat cools the body as it evaporates from the skin, this sublimation cools the surface of Pluto. Even though Pluto is receding from the Sun, in 2002 the atmospheric pressure (0.3 Pa) was higher than in 1988, because in 1987 the south pole of Pluto came out of the shadow for the first time in 120 years, causing extra nitrogen to start sublimating from the polar cap. It will take decades for this nitrogen to condense out of the atmosphere as it freezes onto Pluto's now continuously dark north pole's ice cap. Pluto has five known natural satellites: Charon, first identified in 1978 by astronomer James Christy; Nix and Hydra, both discovered in 2005; Kerberos, discovered in 2011; and Styx, discovered in 2012. The satellites' orbits are circular (eccentricity < 0.006) and coplanar with Pluto's equator (inclination < 1°), and therefore tilted approximately 120° relative to Pluto's orbit. The Plutonian system is highly compact: the five known satellites orbit within the inner 3% of the region where prograde orbits would be stable. Closest to Pluto orbits Charon, which is large enough to be in hydrostatic equilibrium and for the system's barycenter to be outside Pluto. Beyond Charon orbit Pluto's smaller circumbinary moons, Styx, Nix, Kerberos, and Hydra, respectively. The orbital periods of all of Pluto's moons are linked in a system of orbital resonances and near resonances. When precession is accounted for, the orbital periods of Styx, Nix, and Hydra are in an exact 18:22:33 ratio. There is also a 3:4:5:6 sequence of approximate ratios between the periods of Styx, Nix, Kerberos and Hydra with that of Charon, which becomes closer to exact going outward. The Pluto–Charon system is one of the few systems in the Solar System whose barycenter lies above the primary's surface (617 Patroclus is a smaller example, the Sun and Jupiter the only larger one). This and the large size of Charon relative to Pluto have led some astronomers to call it a double dwarf planet. The system is also unusual among planetary systems in that each is tidally locked to the other: Charon always presents the same face to Pluto, and Pluto always presents the same face to Charon: from any position on either body, the other is always at the same position in the sky, or always obscured. This also means that the rotation period of each is equal to the time it takes the entire system to rotate around its common center of gravity. In 2007, observations by the Gemini Observatory of patches of ammonia hydrates and water crystals on the surface of Charon suggested the presence of active cryo-geysers. Pluto's moons are believed to have been formed by a collision between Pluto and a similar-sized body early in the history of the Solar System. The collision released material that consolidated into the moons around Pluto. However, Kerberos has a much lower albedo than the other moons of Pluto, which is difficult to explain with a giant collision. Pluto's origin and identity had long puzzled astronomers. One early hypothesis was that Pluto was an escaped moon of Neptune, knocked out of orbit by its largest current moon, Triton. This idea was eventually rejected after dynamical studies of the two planets' orbits showed it to be impossible. Pluto's true place in the Solar System began to reveal itself only in 1992, when astronomers began to find small icy objects beyond Neptune that were similar to Pluto not only in orbit but also in size and composition. This trans-Neptunian population is believed to be the source of many short-period comets. Astronomers now believe Pluto to be the largestແມ່ແບບ:Efn member of the Kuiper belt, a stable belt of objects located between 30 and 50 AU from the Sun. As of 2011, surveys of the Kuiper belt to magnitude 21 were nearly complete and any remaining Pluto-sized objects are expected to be beyond 100 AU from the Sun. Like other Kuiper-belt objects (KBOs), Pluto shares features with comets; for example, the solar wind is gradually blowing Pluto's surface into space, in the manner of a comet. It has been claimed that if Pluto were placed as near to the Sun as Earth, it would develop a tail, as comets do. This claim has been disputed with the argument that Pluto's escape velocity is too high for this to happen. Though Pluto is the largest Kuiper belt object discovered, Neptune's moon Triton, which is slightly larger than Pluto, is similar to it both geologically and atmospherically and is believed to be a captured Kuiper belt object. Eris (see above) is about the same size as Pluto (though more massive) but is not strictly considered a member of the Kuiper belt population. Rather, it is considered a member of a linked population called the scattered disc. Like other members of the Kuiper belt, Pluto is thought to be a residual planetesimal; a component of the original protoplanetary disc around the Sun that failed to fully coalesce into a full-fledged planet. Most astronomers agree that Pluto owes its current position to a sudden migration undergone by Neptune early in the Solar System's formation. As Neptune migrated outward, it approached the objects in the proto-Kuiper belt, setting one in orbit around itself (Triton), locking others into resonances, and knocking others into chaotic orbits. The objects in the scattered disc, a dynamically unstable region overlapping the Kuiper belt, are believed to have been placed in their current positions by interactions with Neptune's migrating resonances. A computer model created in 2004 by Alessandro Morbidelli of the Observatoire de la Côte d'Azur in Nice suggested that the migration of Neptune into the Kuiper belt may have been triggered by the formation of a 1:2 resonance between Jupiter and Saturn, which created a gravitational push that propelled both Uranus and Neptune into higher orbits and caused them to switch places, ultimately doubling Neptune's distance from the Sun. The resultant expulsion of objects from the proto-Kuiper belt could also explain the Late Heavy Bombardment 600 million years after the Solar System's formation and the origin of the Jupiter trojans. It is possible that Pluto had a near-circular orbit about 33 AU from the Sun before Neptune's migration perturbed it into a resonant capture. The Nice model requires that there were about a thousand Pluto-sized bodies in the original planetesimal disk, which included Triton and Eris. Pluto's distance from Earth makes in-depth study from Earth difficult. On 14 July 2015, NASA's New Horizons space probe flew through the Pluto system, which will provide much information about it. Pluto presents significant challenges for spacecraft because of its small mass and great distance from Earth. Voyager 1 could have visited Pluto, but controllers opted instead for a close flyby of Saturn's moon Titan, resulting in a trajectory incompatible with a Pluto flyby. Voyager 2 never had a plausible trajectory for reaching Pluto. No serious attempt to explore Pluto by spacecraft occurred until the last decade of the 20th century. In August 1992, JPL scientist Robert Staehle telephoned Pluto's discoverer, Clyde Tombaugh, requesting permission to visit his planet. "I told him he was welcome to it", Tombaugh later remembered, "though he's got to go one long, cold trip". Despite this early momentum, in 2000, NASA cancelled the Pluto Kuiper Express mission, citing increasing costs and launch vehicle delays. After an intense political battle, a revised mission to Pluto, dubbed New Horizons, was granted funding from the US government in 2003. New Horizons was launched successfully on 19 January 2006. The mission leader, S. Alan Stern, confirmed that some of the ashes of Clyde Tombaugh, who died in 1997, had been placed aboard the spacecraft. New Horizons captured its first (distant) images of Pluto in late September 2006, during a test of the Long Range Reconnaissance Imager (LORRI). The images, taken from a distance of approximately 4.2 billion kilometers, confirmed the spacecraft's ability to track distant targets, critical for maneuvering toward Pluto and other Kuiper belt objects. In early 2007 the craft made use of a gravity assist from Jupiter. On 4 February 2015, NASA released new images of Pluto (taken on 25 and 27 January) from the approaching probe. New Horizons was more than ແມ່ແບບ:Convert away from Pluto when it began taking the photos, which showed Pluto and its largest moon, Charon. On 20 March 2015, NASA invited the general public to suggest names for surface features that will be discovered on Pluto and Charon. On 15 April 2015, Pluto was imaged showing a possible polar cap. Between April and June 2015, New Horizons began returning images of Pluto that exceeded the quality that the Hubble Space Telescope could produce. Pluto's small moons, discovered shortly before and after the probe's launch, were considered to be potentially hazardous, as debris from collisions between Kuiper belt objects and the smaller moons, with their relatively low escape velocities, could have produced a tenuous dusty ring. If New Horizons had travelled through such a ring system, there would have been an increased risks for ແມ່ແບບ:Dp damage that could have disable the probe. The space probe had its closest approach to Pluto on 14 July 2015—after a 3,462 day journey across the Solar System. Scientific observations of Pluto have begun five months before the closest approach and will continue for at least a month after the encounter. New Horizons used a remote sensing package that includes imaging instruments and a radio science investigation tool, as well as spectroscopic and other experiments, to characterize the global geology and morphology of Pluto and its moon Charon, map their surface composition and analyze Pluto's neutral atmosphere and its escape rate. New Horizons also photographed the surfaces of Pluto and Charon. ↑ Stern, S. Alan; Mitton, Jacqueline (2005). "Pluto and Charon: ice worlds on the ragged edge of the solar system". Weinheim:Wiley-VCH. ISBN 3-527-40556-9. ສືບຄົ້ນເມືອ 3 July 2013. ↑ "Astronomers Measure Mass of Largest Dwarf Planet". hubblesite. 2007. ສືບຄົ້ນເມືອ 3 November 2007. ↑ Gray, Richard (10 August 2008). "Pluto should get back planet status, say astronomers". The Telegraph. ສືບຄົ້ນເມືອ 9 August 2008. ↑ ໗.໐ ໗.໑ "Should Large Moons Be Called 'Satellite Planets'?". News.discovery.com. 14 May 2010. ສືບຄົ້ນເມືອ 4 November 2011. ↑ Olkin, Catherine B.; Wasserman, Lawrence H.; Franz, Otto G. (2003). "The mass ratio of Charon to Pluto from Hubble Space Telescope astrometry with the fine guidance sensors". Icarus (Lowell Observatory) 164 (1): 254–259. Bibcode:2003Icar..164..254O. doi:10.1016/S0019-1035(03)00136-2. ສືບຄົ້ນເມືອ 13 March 2007. ↑ "Pluto and the Developing Landscape of Our Solar System" International Astronomical Union. Retrieved on 27 October 2010. ↑ ໑໕.໐ ໑໕.໑ Tombaugh, Clyde W. (1946). "The Search for the Ninth Planet, Pluto". Astronomical Society of the Pacific Leaflets 5: 73–80. Bibcode:1946ASPL....5...73T. ↑ ໑໖.໐ ໑໖.໑ ໑໖.໒ Hoyt, William G. (1976). "W. H. Pickering's Planetary Predictions and the Discovery of Pluto". Isis 67 (4): 551–564. JSTOR 230561. doi:10.1086/351668. ↑ Buchwald, Greg; Dimario, Michael; Wild, Walter (2000). "Pluto is Discovered Back in Time". Amateur—Professional Partnerships in Astronomy (San Francisco: San Francisco: Astronomical Society of the Pacific) 220: 335. Bibcode:2000ASPC..220..355B. ISBN 1-58381-052-8. ↑ ໑໙.໐ ໑໙.໑ Rao, Joe (11 March 2005). "Finding Pluto: Tough Task, Even 75 Years Later". Space.com. ສືບຄົ້ນເມືອ 8 September 2006. ↑ Mager, Brad. "The Search Continues". Pluto: The Discovery of Planet X. ສືບຄົ້ນເມືອ 29 November 2011. ↑ "NASA's Solar System Exploration: Multimedia: Gallery: Pluto's Symbol". NASA. ສືບຄົ້ນເມືອ 29 November 2011. ↑ Heinrichs, Allison M. (2006). "Dwarfed by comparison". Pittsburgh Tribune-Review. ສືບຄົ້ນເມືອ 26 March 2007. ↑ Clark, David L.; Hobart, David E. (2000). "Reflections on the Legacy of a Legend". ສືບຄົ້ນເມືອ 29 November 2011. ↑ Renshaw, Steve; Ihara, Saori (2000). "A Tribute to Houei Nojiri". ສືບຄົ້ນເມືອ 29 November 2011. ↑ ໒໘.໐ ໒໘.໑ ໒໘.໒ "Planetary Linguistics". Archived from the original on 17 December 2007. ສືບຄົ້ນເມືອ 12 June 2007. ↑ 'Bathrobe'. "Uranus, Neptune, and Pluto in Chinese, Japanese, and Vietnamese". cjvlang.com. ສືບຄົ້ນເມືອ 29 November 2011. ↑ Crommelin, Andrew Claude de la Cherois (1931). "The Discovery of Pluto". Monthly Notices of the Royal Astronomical Society 91: 380–385. Bibcode:1931MNRAS..91..380.. doi:10.1093/mnras/91.4.380. ↑ ໓໒.໐ ໓໒.໑ Nicholson, Seth B.; Mayall, Nicholas U. (December 1930). "The Probable Value of the Mass of Pluto". Publications of the Astronomical Society of the Pacific 42 (250): 350. Bibcode:1930PASP...42..350N. doi:10.1086/124071. ↑ Nicholson, Seth B.; Mayall, Nicholas U. (January 1931). "Positions, Orbit, and Mass of Pluto". Astrophysical Journal 73: 1. Bibcode:1931ApJ....73....1N. doi:10.1086/143288. ↑ ໓໔.໐ ໓໔.໑ Kuiper, Gerard P. (1950). "The Diameter of Pluto". Publications of the Astronomical Society of the Pacific 62 (366): 133–137. Bibcode:1950PASP...62..133K. doi:10.1086/126255. ↑ Christy, James W.; Harrington, Robert Sutton (1978). "The Satellite of Pluto". Astronomical Journal 83 (8): 1005–1008. Bibcode:1978AJ.....83.1005C. doi:10.1086/112284. ↑ ໓໖.໐ ໓໖.໑ ໓໖.໒ Buie, Marc W.; Grundy, William M.; Young, Eliot F. ແລະຄະນະ (2006). "Orbits and photometry of Pluto's satellites: Charon, S/2005 P1, and S/2005 P2". Astronomical Journal 132 (1): 290. Bibcode:2006AJ....132..290B. arXiv:astro-ph/0512491. doi:10.1086/504422. ↑ ໓໗.໐ ໓໗.໑ Williams, David R. (7 September 2006). "Pluto Fact Sheet". NASA. ສືບຄົ້ນເມືອ 24 March 2007. ↑ Seidelmann, P. Kenneth; Harrington, Robert Sutton (1988). "Planet X – The current status". Celestial Mechanics and Dynamical Astronomy 43: 55–68. Bibcode:1987CeMec..43...55S. doi:10.1007/BF01234554. ສືບຄົ້ນເມືອ 29 November 2011. ↑ ໓໙.໐ ໓໙.໑ Standish, E. Myles (1993). "Planet X—No dynamical evidence in the optical observations". Astronomical Journal 105 (5): 200–2006. Bibcode:1993AJ....105.2000S. doi:10.1086/116575. ↑ "History I: The Lowell Observatory in 20th century Astronomy". The Astronomical Society of the Pacific. 28 June 1994. ສືບຄົ້ນເມືອ 29 November 2011. ↑ Tyson, Neil deGrasse (2 February 2001). "Astronomer Responds to Pluto-Not-a-Planet Claim". Space.com. ສືບຄົ້ນເມືອ 30 November 2011. ↑ "NASA-Funded Scientists Discover Tenth Planet". NASA press releases. 29 July 2005. ສືບຄົ້ນເມືອ 22 February 2007. ↑ ໔໔.໐ ໔໔.໑ Soter, Steven (2007). "What is a Planet?". The Astronomical Journal (Department of Astrophysics, American Museum of Natural History) 132 (6): 2513. Bibcode:2006AJ....132.2513S. arXiv:astro-ph/0608359. doi:10.1086/508861. ↑ ໔໖.໐ ໔໖.໑ "IAU 2006 General Assembly: Result of the IAU Resolution votes". International Astronomical Union (News Release – IAU0603). 24 August 2006. ສືບຄົ້ນເມືອ 15 June 2008. ↑ Green, Daniel W. E. (13 September 2006). "(134340) Pluto, (136199) Eris, and (136199) Eris I (Dysnomia)". IAU Circular 8747. Archived from the original on 5 February 2007. ສືບຄົ້ນເມືອ 1 December 2011. ↑ Buie, Marc W. (September 2006). "My response to 2006 IAU Resolutions 5a and 6a". Southwest Research Institute. Archived from the original on 3 June 2007. ສືບຄົ້ນເມືອ 1 December 2011. ↑ Holden, Constance (23 March 2007). "Rehabilitating Pluto". Science 315 (5819): 1643. doi:10.1126/science.315.5819.1643c. ↑ Gutierrez, Joni Marie (2007). "A joint memorial. Declaring Pluto a planet and declaring March 13, 2007, 'Pluto planet day' at the legislature". Legislature of New Mexico. ສືບຄົ້ນເມືອ 5 September 2009. ↑ "Illinois General Assembly: Bill Status of SR0046, 96th General Assembly". ilga.gov. Illinois General Assembly. ສືບຄົ້ນເມືອ 16 March 2011. ↑ Minkel, J. R. (10 April 2008). "Is Rekindling the Pluto Planet Debate a Good Idea?". Scientific American. ສືບຄົ້ນເມືອ 1 December 2011. ↑ "The Great Planet Debate: Science as Process. A Scientific Conference and Educator Workshop". gpd.jhuapl.edu. Johns Hopkins University Applied Physics Laboratory. 27 June 2008. ສືບຄົ້ນເມືອ 1 December 2011. ↑ "Plutoid chosen as name for Solar System objects like Pluto". Paris: International Astronomical Union (News Release – IAU0804). 11 June 2008. ສືບຄົ້ນເມືອ 1 December 2011. ↑ "Pluto to become most distant planet". JPL/NASA. 28 January 1999. ສືບຄົ້ນເມືອ 16 January 2011. ↑ Sussman, Gerald Jay; Wisdom, Jack (1988). "Numerical evidence that the motion of Pluto is chaotic". Science 241 (4864): 433–437. Bibcode:1988Sci...241..433S. PMID 17792606. doi:10.1126/science.241.4864.433. ↑ Wisdom, Jack; Holman, Matthew (1991). "Symplectic maps for the n-body problem". Astronomical Journal 102: 1528–1538. Bibcode:1991AJ....102.1528W. doi:10.1086/115978. ↑ ໗໑.໐ ໗໑.໑ ໗໑.໒ ໗໑.໓ Wan, Xiao-Sheng; Huang, Tian-Yi; Innanen, Kim A. (2001). "The 1:1 Superresonance in Pluto's Motion". The Astronomical Journal 121 (2): 1155–1162. Bibcode:2001AJ....121.1155W. doi:10.1086/318733. ↑ Hunter, Maxwell W. (2004). "Unmanned scientific exploration throughout the Solar System". Space Science Reviews 6 (5): 501. Bibcode:1967SSRv....6..601H. doi:10.1007/BF00168793. ↑ ໗໓.໐ ໗໓.໑ ໗໓.໒ ໗໓.໓ Malhotra, Renu (1997). "Pluto's Orbit". ສືບຄົ້ນເມືອ 26 March 2007. ↑ Williams, David R. (17 November 2010). "Planetary Fact Sheet – Metric". NASA Goddard Space Flight Center. ສືບຄົ້ນເມືອ 29 November 2011. ↑ ໗໕.໐ ໗໕.໑ ໗໕.໒ Alfvén, Hannes; Arrhenius, Gustaf (1976). "SP-345 Evolution of the Solar System". ສືບຄົ້ນເມືອ 28 March 2007. ↑ ໗໖.໐ ໗໖.໑ Williams, James G.; Benson, G. S. (1971). "Resonances in the Neptune-Pluto System". Astronomical Journal 76: 167. Bibcode:1971AJ.....76..167W. doi:10.1086/111100. ↑ ໗໗.໐ ໗໗.໑ Faure, Gunter; Mensing, Teresa M. (2007). "Pluto and Charon: The Odd Couple". Introduction to Planetary Science (Springer). pp. 401–408. ISBN 978-1-4020-5544-7. doi:10.1007/978-1-4020-5544-7. ↑ "Pluto Time". NASA Solar System Exploration. ສືບຄົ້ນເມືອ 13 July 2015. ↑ "NASA Lets You Experience “Pluto Time” with New Custom Tool". NASA. 5 June 2015. ↑ "NOAA Solar Calculator". NOAA Earth System Research Laboratory Global Monitoring Division. ສືບຄົ້ນເມືອ 13 July 2015. ↑ ໘໒.໐ ໘໒.໑ de la Fuente Marcos, Carlos; de la Fuente Marcos, Raúl (2012). "Plutino 15810 (ແມ່ແບບ:Mp), an accidental quasi-satellite of Pluto". Monthly Notices of the Royal Astronomical Society Letters 427: L85. Bibcode:2012MNRAS.427L..85D. arXiv:1209.3116. doi:10.1111/j.1745-3933.2012.01350.x. ↑ "Pluto's fake moon". ສືບຄົ້ນເມືອ 24 September 2012. ↑ Owen, Tobias C.; Roush, Ted L.; Cruikshank, Dale P. ແລະຄະນະ (1993). "Surface Ices and the Atmospheric Composition of Pluto". Science 261 (5122): 745–748. Bibcode:1993Sci...261..745O. PMID 17757212. doi:10.1126/science.261.5122.745. ↑ Buie, Marc W.; Grundy, William M.; Young, Eliot F. ແລະຄະນະ (2010). "Pluto and Charon with the Hubble Space Telescope: I. Monitoring global change and improved surface properties from light curves". Astronomical Journal 139 (3): 1117–1127. Bibcode:2010AJ....139.1117B. doi:10.1088/0004-6256/139/3/1117. ↑ ໘໘.໐ ໘໘.໑ Buie, Marc W. "Pluto map information". ສືບຄົ້ນເມືອ 10 February 2010. ↑ Villard, Ray; Buie, Marc W. (4 February 2010). "New Hubble Maps of Pluto Show Surface Changes". News Release Number: STScI-2010-06. ສືບຄົ້ນເມືອ 10 February 2010. ↑ ໙໐.໐ ໙໐.໑ Buie, Marc W.; Grundy, William M.; Young, Eliot F. ແລະຄະນະ (2010). "Pluto and Charon with the Hubble Space Telescope: II. Resolving changes on Pluto's surface and a map for Charon". Astronomical Journal 139 (3): 1128–1143. Bibcode:2010AJ....139.1128B. doi:10.1088/0004-6256/139/3/1128. ↑ "The Inside Story". pluto.jhuapl.edu – NASA New Horizons mission site. Johns Hopkins University Applied Physics Laboratory. 2007. ສືບຄົ້ນເມືອ 15 February 2014. ↑ Millis, Robert L.; Wasserman, Lawrence H.; Franz, Otto G. ແລະຄະນະ (1993). "Pluto's radius and atmosphere – Results from the entire 9 June 1988 occultation data set". Icarus 105 (2): 282. Bibcode:1993Icar..105..282M. doi:10.1006/icar.1993.1126. ↑ Young, Eliot F.; Binzel, Richard P. (1994). "A new determination of radii and limb parameters for Pluto and Charon from mutual event lightcurves". Icarus 108 (2): 219–224. Bibcode:1994Icar..108..219Y. doi:10.1006/icar.1994.1056. ↑ ໙໖.໐ ໙໖.໑ Young, Eliot F.; Young, Leslie A.; Buie, Marc W. (2007). "Pluto's Radius". American Astronomical Society, DPS meeting No. 39, #62.05; Bulletin of the American Astronomical Society 39: 541. Bibcode:2007DPS....39.6205Y. ↑ Zalucha, Angela M.; Gulbis, Amanda A. S.; Zhu, Xun ແລະຄະນະ (2011). "An analysis of Pluto occultation light curves using an atmospheric radiative-conductive model". Icarus 211 (1). Bibcode:2011Icar..211..804Z. doi:10.1016/j.icarus.2010.08.018. ↑ ໙໘.໐ ໙໘.໑ Lellouch, Emmanuel; de Bergh, Catherine; Sicardy, Bruno ແລະຄະນະ (13 March 2014). "Exploring the spatial, temporal, and vertical distribution of methane in Pluto's atmosphere". Icarus. Bibcode:2015Icar..246..268L. arXiv:1403.3208. doi:10.1016/j.icarus.2014.03.027. ↑ ໙໙.໐ ໙໙.໑ ໙໙.໒ ໙໙.໓ "How Big Is Pluto? New Horizons Settles Decades-Long Debate". NASA. 13 July 2015. ສືບຄົ້ນເມືອ 13 July 2015. ↑ Davies, John (2001). "Beyond Pluto (extract)". Royal Observatory, Edinburgh. ສືບຄົ້ນເມືອ 26 March 2007. ↑ Close, Laird M.; Merline, William J.; Tholen, David J. ແລະຄະນະ (2000). "Adaptive optics imaging of Pluto–Charon and the discovery of a moon around the Asteroid 45 Eugenia: the potential of adaptive optics in planetary astronomy". Proceedings of the International Society for Optical Engineering (European Southern Observatory) 4007: 787–795. Bibcode:2000SPIE.4007..787C. doi:10.1117/12.390379. ↑ Croswell, Ken (1992). "Nitrogen in Pluto's Atmosphere". ສືບຄົ້ນເມືອ 27 April 2007. ↑ Lellouch, Emmanuel; Sicardy, Bruno; de Bergh, Catherine ແລະຄະນະ (2009). "Pluto's lower atmosphere structure and methane abundance from high-resolution spectroscopy and stellar occultations". Astronomy and Astrophysics 495 (3): L17–L21. Bibcode:2009A&A...495L..17L. arXiv:0901.4882. doi:10.1051/0004-6361/200911633. ↑ ໑໐໖.໐ ໑໐໖.໑ Lellouch, Emmanuel; Sicardy, Bruno; de Bergh, Catherine (2009). "Pluto's lower atmosphere structure and methane abundance from high-resolution spectroscopy and stellar occultations". Astronomy & Astrophysics. ↑ Britt, Robert Roy (2003). "Puzzling Seasons and Signs of Wind Found on Pluto". Space.com. Archived from the original on 9 January 2009. ສືບຄົ້ນເມືອ 26 March 2007. ↑ Gugliotta, Guy (1 November 2005). "Possible New Moons for Pluto". Washington Post. ສືບຄົ້ນເມືອ 10 October 2006. ↑ "NASA's Hubble Discovers Another Moon Around Pluto". NASA. 20 July 2011. ສືບຄົ້ນເມືອ 20 July 2011. ↑ Buie, M.; Tholen, D.; Grundy, W. (2012). "The Orbit of Charon is Circular". The Astronomical Journal 144: 15. Bibcode:2012AJ....144...15B. doi:10.1088/0004-6256/144/1/15. ↑ ໑໑໒.໐ ໑໑໒.໑ ໑໑໒.໒ ໑໑໒.໓ Showalter, M. R.; Hamilton, D. P. (3 June 2015). "Resonant interactions and chaotic rotation of Pluto’s small moons". Nature 522 (7554): 45–49. Bibcode:2015Natur.522...45S. doi:10.1038/nature14469. ↑ Stern, S. Alan; Weaver, Harold A., Jr.; Steffl, Andrew J. ແລະຄະນະ (2006). "Characteristics and Origin of the Quadruple System at Pluto". Nature 439 (7079): 946–948. Bibcode:2006Natur.439..946S. PMID 16495992. arXiv:astro-ph/0512599. doi:10.1038/nature04548. ↑ Witze, Alexandra (2015). "Pluto’s moons move in synchrony". Nature. doi:10.1038/nature.2015.17681. ↑ Matson, J. (11 July 2012). "New Moon for Pluto: Hubble Telescope Spots a 5th Plutonian Satellite". Scientific American web site. ສືບຄົ້ນເມືອ 12 July 2012. ↑ Richardson, Derek C.; Walsh, Kevin J. (2005). "Binary Minor Planets". Annual Review of Earth and Planetary Sciences 34 (1): 47–81. Bibcode:2006AREPS..34...47R. doi:10.1146/annurev.earth.32.101802.120208. ↑ Sicardy, Bruno; Bellucci, Aurélie; Gendron, Éric ແລະຄະນະ (2006). "Charon's size and an upper limit on its atmosphere from a stellar occultation". Nature 439 (7072): 52–4. Bibcode:2006Natur.439...52S. PMID 16397493. doi:10.1038/nature04351. ↑ Young, Leslie A. (1997). "The Once and Future Pluto". Southwest Research Institute, Boulder, Colorado. ສືບຄົ້ນເມືອ 26 March 2007. ↑ "Charon: An ice machine in the ultimate deep freeze". Gemini Observatory News Release. 2007. ສືບຄົ້ນເມືອ 18 July 2007. ↑ "NASA's Hubble Finds Pluto’s Moons Tumbling in Absolute Chaos". ສືບຄົ້ນເມືອ 3 June 2015. ↑ "Pluto's moons are even weirder than thought". ສືບຄົ້ນເມືອ 20 June 2015. ↑ "Pluto's moons dance to a random beat". ສືບຄົ້ນເມືອ 20 June 2015. ↑ "Much ado about Pluto". 1999. ສືບຄົ້ນເມືອ 24 June 2015. ↑ The Michigan Technic Volumes 78–79. University of Michigan. 1959. p. =101. ສືບຄົ້ນເມືອ 23 June 2015. ↑ Sheppard, Scott S.; Trujillo, Chadwick A.; Udalski, Andrzej ແລະຄະນະ (2011). "A Southern Sky and Galactic Plane Survey for Bright Kuiper Belt Objects". Astronomical Journal 142 (4). Bibcode:2011AJ....142...98S. arXiv:1107.5309. doi:10.1088/0004-6256/142/4/98. ↑ "Colossal Cousin to a Comet?". pluto.jhuapl.edu – NASA New Horizons mission site. Johns Hopkins University Applied Physics Laboratory. Archived from the original on 13 November 2014. ສືບຄົ້ນເມືອ 15 February 2014. ↑ Tyson, Neil deGrasse (1999). "Pluto Is Not a Planet". The Planetary Society. Archived from the original on 27 September 2011. ສືບຄົ້ນເມືອ 30 November 2011. ↑ "Neptune's Moon Triton". The Planetary Society. Archived from the original on 10 December 2011. ສືບຄົ້ນເມືອ 30 November 2011. ↑ Jewitt, David C. (2004). "The Plutinos". University of Hawaii. Archived from the original on 19 April 2007. ສືບຄົ້ນເມືອ 26 March 2007. ↑ Hahn, Joseph M. (2005). "Neptune's Migration into a Stirred–Up Kuiper Belt: A Detailed Comparison of Simulations to Observations". Saint Mary's University. ສືບຄົ້ນເມືອ 5 March 2008. ↑ ໑໓໒.໐ ໑໓໒.໑ Levison, Harold F.; Morbidelli, Alessandro; Van Laerhoven, Christa ແລະຄະນະ (2007). "Origin of the Structure of the Kuiper Belt during a Dynamical Instability in the Orbits of Uranus and Neptune". Icarus 196 (1): 258. Bibcode:2008Icar..196..258L. arXiv:0712.0553. doi:10.1016/j.icarus.2007.11.035. ↑ Malhotra, Renu (1995). "The Origin of Pluto's Orbit: Implications for the Solar System Beyond Neptune". Astronomical Journal 110: 420. Bibcode:1995AJ....110..420M. arXiv:astro-ph/9504036. doi:10.1086/117532. ↑ "This month Pluto's apparent magnitude is m=14.1. Could we see it with an 11" reflector of focal length 3400 mm?". Singapore Science Centre. 2002. Archived from the original on 11 November 2005. ສືບຄົ້ນເມືອ 29 November 2011. ↑ Young, Eliot F.; Binzel, Richard P.; Crane, Keenan (2000). "A Two-Color Map of Pluto Based on Mutual Event Lightcurves". Bulletin of the American Astronomical Society (AA(SwRI), AB(M.I.T. ), AC (Boulder High School)) 32: 1083. Bibcode:2000DPS....32.4601Y. ↑ Buie, Marc W.; Tholen, David J.; Horne, Keith (1992). "Albedo maps of Pluto and Charon: Initial mutual event results". Icarus 97 (2): 221–227. Bibcode:1992Icar...97..211B. doi:10.1016/0019-1035(92)90129-U. ↑ ໑໓໗.໐ ໑໓໗.໑ Buie, Marc W. "How the Pluto maps were made". ສືບຄົ້ນເມືອ 10 February 2010. ↑ "Voyager Frequently Asked Questions". Jet Propulsion Laboratory. 14 January 2003. ສືບຄົ້ນເມືອ 8 September 2006. ↑ Sobel, Dava (1993). "The last world". Discover magazine. ສືບຄົ້ນເມືອ 13 April 2007. ↑ Williams, David R. (2005). "Pluto Kuiper Express". NASA Goddard Space Flight Center. ສືບຄົ້ນເມືອ 26 March 2007. ↑ Britt, Robert Roy (2003). "Pluto Mission a Go! Initial Funding Secured". space.com. Archived from the original on 23 August 2010. ສືບຄົ້ນເມືອ 13 April 2007. ↑ Stern, S. Alan (2006). "Happy 100th Birthday, Clyde Tombaugh". Southwest Research Institute. ສືບຄົ້ນເມືອ 13 April 2007. ↑ "New Horizons, Not Quite to Jupiter, Makes First Pluto Sighting". pluto.jhuapl.edu – NASA New Horizons mission site. Johns Hopkins University Applied Physics Laboratory. 28 November 2006. ສືບຄົ້ນເມືອ 29 November 2011. ↑ "Happy Birthday Clyde Tombaugh: New Horizons Returns New Images of Pluto". pluto.jhuapl.edu – NASA New Horizons mission site. Johns Hopkins University Applied Physics Laboratory. 4 February 2015. ສືບຄົ້ນເມືອ 14 July 2015. ↑ Help us put names on the maps of Pluto and Charon! ↑ Brown, Dwayne; Buckley, Michael (29 April 2015). "NASA’s New Horizons Detects Surface Features, Possible Polar Cap on Pluto". National Aeronautics and Space Administration. ສືບຄົ້ນເມືອ 30 April 2015. ↑ NASA (2015). "Timeline". New Horizons News Center, Johns Hopkins Applied Physics Laboratory. ສືບຄົ້ນເມືອ 14 July 2015. ↑ Morring, Jr., Frank (29 April 2015). "New Horizons Delivering Pluto Imagery With Better Resolution Than Hubble". aviationweek.com. ສືບຄົ້ນເມືອ 14 July 2015. ↑ Steffl, Andrew J.; Stern, S. Alan (2007). "First Constraints on Rings in the Pluto System". The Astronomical Journal 133 (4): 1485–1489. Bibcode:2007AJ....133.1485S. arXiv:astro-ph/0608036. doi:10.1086/511770. ↑ Powell, James; Maise, George; Paniagua, John (8–15 March 2003). "Pluto Orbiter/lander/sample return missions using the MITEE nuclear engine". 2003 IEEE Aerospace Conference (Ieeexplore.ieee.org). ISBN 0-7803-7651-X. doi:10.1109/AERO.2003.1235077. ສືບຄົ້ນເມືອ 22 November 2011. Cite error: <ref> tag with name "planet_years" defined in <references> is not used in prior text. Cite error: <ref> tag with name "Hamilton" defined in <references> is not used in prior text. Cite error: <ref> tag with name "AstDys-Pluto" defined in <references> is not used in prior text. Cite error: <ref> tag with name "jpldata" defined in <references> is not used in prior text. Cite error: <ref> tag with name "Physorg April 19, 2011" defined in <references> is not used in prior text. Cite error: <ref> tag with name "About New Horizons" defined in <references> is not used in prior text. Cite error: <ref> tag with name "Archinal" defined in <references> is not used in prior text. Cite error: <ref> tag with name "horizons" defined in <references> is not used in prior text.